Flemish sculptor (called also Pierre de Francqueville or Francheville). From a noble family, he learnt to draw in Paris in 15624. In 1565 he went to Innsbruck, presumably to assist Alexander Colyn on the great tomb in the Hofkirche for the Holy Roman Emperor Maximilian I, and this is probably where he learnt sculpture. Archduke Ferdinand of Austria gave him a letter of introduction to Giambologna c. 1570, and he went to Florence, where he was sufficiently skilled at carving to become a partner of Giambologna, not merely an assistant. Francavillas first important commission, for 13 marble statues of mythological subjects for the garden of a villa at Rovezzano, came from Abbot Antonio Bracci in 1574 and was delegated to him probably because Giambologna was heavily occupied. 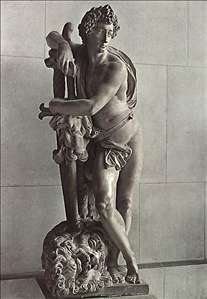 The earliest of these to be signed and dated, Zephyr (1576) and Apollo (1577; both London, Kensington Palace), are obviously derivations of compositions by Giambologna. Four others (Windsor Castle, Royal Collection) are less indebted to the master, while the last in date is quite different from his style, showing Venus with a Nymph and Satyr arranged frontally, instead of spirally. With his son-in-law Bordoni he went to France as an already famous artist under the name Francavilla and brought with him the Tuscan Mannerism to the court of Henri lV. As official sculptor to the king, he was asked to collaborate on the equestrian statue of Henri lV, erected on the tip of the Ile de la Cit, by the Pont Neuf. While the statue itself, commissioned by Queen Marie de Mdicis in Florence as early as 1604, was by Pietro Tacca, another pupil of Giambologna, the four slaves at each corner of the pedestal were cast by Bordoni in 1618 after models made by Francqueville before his death (1615). See more details about "David"
See more details about "Winter"